Obviously if you do all the photos with the iPhone is not as useful, but if you bring the photos you do with other cameras can resultaros very helpful to see all the information for each photo. It does not add icons or settings to disable uninstall from Cydia. 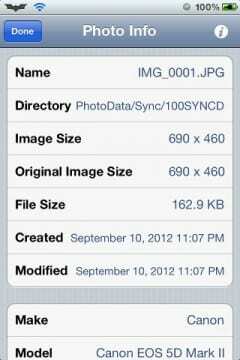 Article Photo Info: EXIF data of your photos (Cydia) was originally published in News iPhone .